The cost per player is $250.00. This $350.00 must be paid before the player plays his first game. Because of the high cost of League Fees, Insurance, Baseballs, Field Rentals, Umpires, etc., The cost to play on this team per player is $250. We are closing the roster at (15) players for this team. In order to participate in this opportunity, please sign the contact on the back and return as soon as you can. 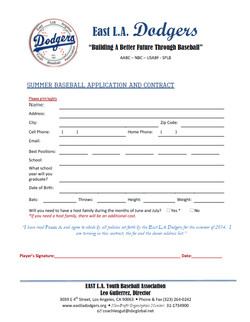 Those who turn it in after the (15) man roster is filled, will be put on the waiting list.